Chocolate festivals are as various and specific as the countries whose chocolate they celebrate, but they have one thing in common – lots of lovely chocolate! 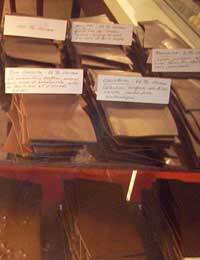 Turin in Italy is famed for its annual celebration of all things chocolate, known as the Cioccolatò. Although the festival takes place all over the city, it has a central focus in the Piazza Vittorio Veneto and for the past two or three years has been much more open to the contributions of chocolatiers from around the globe – until recently it was very much a festival for Italy’s own chocolate experts rather than for the world’s finest chocolate makers. Taking place between the end of February and March or in the first two weeks of March every year, this ten day festival is timed to work with the dates for Easter so that devout Catholics can enjoy the full taste of the displayed chocolates before Lent limits their ability to indulge. Around 700,000 thousand people visit the Cioccolatò every year from all around the world and between them they manage to eat around 30,000 kilos of chocolate from the stalls that line the Piazza. In addition, there are special events that look at the relationship between chocolate and other foods such as coffee and tea, various herbs, almonds and fruit – there are also more unusual combinations to explore such as chocolate and cheese, and chocolate and olive oil. Held in British Columbia, Canada, the West Coast Chocolate Festival was launched in 2002. It’s an usual festival in that it has more than one focus: one is to delight chocolate lovers, of course, but another is to draw attention to the range of talents and businesses to be found in the TriCity area of Coquitlam, Port Moody and Port Coquitlam. Finally, there’s a desire to empower local young people by offering the positions in the many projects that are part of the festival and giving them a chance to deepen their studies and be mentored by experts. The West Coast Chocolate Festival is carefully designed to work for all ages, with some adult only style events and lots of fun for children, including a Charlie and the Chocolate Factory theme experience in 2008. Although it began as an annual event, the Festival is now run every two years, over a five day period in November, trying to hit the low period between the end of Halloween and the beginning of Thanksgiving. The Versoix Chocolate Festival is another spring festival, taking place in March just outside Geneva. It’s a free event and there are special buses and boats that bring visitors from central Geneva to Versoix. In previous years the festival has not only had up to thirteen Swiss chocolatiers showing their work, but has had a theme that has led to innovation in chocolate – in 2008 it was astronomy, with chocolate-makers presenting whole planets made of chocolate! There are also many stalls giving visitors the chance ‘try and buy’ with samples being offered from right across French-speaking Switzerland and neighbouring France. More than 20,000 people attended the 2009 festival.